The dancing can continue at Sandbar after the Santa Barbara City Council upheld the Fire and Police Commission's decision to approve a dance permit there. The patrons of Stateside Restaurant and Lounge is ready to kick off their shoes and get down after the recent approval of a dance permit by the Santa Barbara Fire and Police Commission. The process of acquiring a permit took about four months, which forced Stateside to instigate a “no dancing” policy in October when it first opened in La Arcada Court. Nevertheless, according to Stateside manager Warren Butler, overall the process went smoothly. “We were very proactive about finding out what the process and requirements were,” he recalled. They made sure that they met all security requirements, including installing cameras and hiring the necessary number of security personnel, agreed to refrain from playing music on their outside patio area after 10 p.m., and filled out all of the paperwork required by the commission. Stateside’s recent permit acquisition may have narrowly avoided being swept up in the controversy and complications of an ongoing debate over the city’s dance permit policy. The city Ordinance Committee, made up of City Council members, has been discussing changes to the relevant municipal code for months and a formal proposal is being prepared for a January 15 City Council meeting. 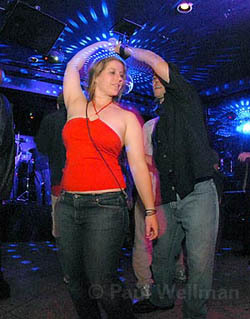 This may include previously discussed changes such as capping the number of dance permits on lower State Street at the current 14 and issuing a maximum of 25 in the city, requiring annual renewal of the permits including a “premise inspection,” and requiring a criminal background check of each club’s owner. These precautions may seem unnecessary for a permit that allows for nothing more than your average dancer’s spinning and shaking. That’s because in reality the dance permit restrictions have nothing to do with the subtle dangers of the merengue. Instead, policymakers and community members alike are using the permit as a way to regulate other aspects of a nightclub’s practices. In the current process, the city already uses the permit as an incentive to make sure that nightclubs have adequate security and to encourage the responsible business practices of their owners. In fact, the permit is the only aspect of a nightclub over which the city has direct influence. As we saw last spring with the granting and attempted repeal of the Sandbar’s permit, there are two sides to the dance permit debate and both have some vocal proponents in the community. In that instance, after the Sandbar’s new ownership had successfully met the Fire and Police Commission’s requirements and was approved for a new dance permit, representatives from local businesses including the Hotel Santa Barbara and the Holiday Inn Express attended the meeting and tried unsuccessfully to overturn the decision, citing noise pollution as their main objection. “We have a specific spot in the hotel that is very close to Madisons and sometimes we do get complaints [about the noise],” said Jason Mehrens, longtime front desk agent for Hotel Santa Barbara. The hotels’ concerns about its guest’s comfort may be legitimate, but will the issuing of a dance permit increase a bar’s volume level? Mehrens doesn’t seem to think so. “It’s pretty loud anyway. I don’t know if a dance permit would really change things,” he said. At least Butler and the owners of the new Stateside Restaurant and Lounge can rest easy knowing that they escaped the possible difficulties faced by business owners looking to expand into the dance arena in the new year. Everyone else concerned will have the opportunity to speak their mind at the City Council meeting on January 15, at which a full report and a proposal for a new Dance Permit Ordinace will be presented. Attempts to interview members of the Fire and Police Commission for this story were unsuccessful, but the Santa Barbara Police Department’s Captain Robert Lowry, who has been highly involved in the dance permit issue, said he appreciated on-going discussion of the matter. “It’s great for the process to hear how different people feel about the issue,” Lowry said.